We are engaged in offering our prestigious clients a very highly premium quality range of Industrial Colour Roofing Sheet. Our Colour Roofing Sheet range is known for its excellent quality, robust range and durable in nature. Our range is available at market most leading price. 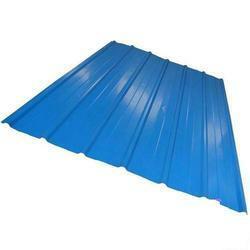 We are Prominent manufacturers & Suppliers of PPGI Roofing Sheets. PPGI Sheets are highly durable roofing sheets which have high-quality color coating throughout the roof or cladding. Our product is using color coating steel plate and the roller of cold bending into various wave types of a pressure plate. It is used in industrial and civil building, warehouse, construction, large span steel structure housing roof, walls, and internal and external wall decoration, is a lightweight, high strength, color-rich, convenient and quick construction, earthquake, fire, rain, long service life, maintenance-free characteristics, has been widely applied. 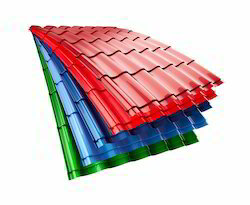 Furthermore, designed to perfection, these products are ideal for covering roofs of open sheds owing to their below cited attributes: Durability Dimensional stability Smooth finish Resistance against corrosion UV protected Water proof Keeping in mind divergent demands of the clients, we offer these products in different sizes and colors at an economical price. Looking for Colour Roofing Sheet ?